A major fire broke out on the Astonfields Industrial estate in Stafford last week. The cause of the fire, which raged on Wednesday 2nd March 2016, remains unknown and is being investigated by the Staffordshire Fire Service. The fire was first flagged by a worker on the premises. It has been widely reported that the fire began at some time near 8.45am, and that the building collapsed by 11am. More than 70 firefighters were needed to prevent the fire, which they were able to contain by Wednesday afternoon. The factory was storing 40,000 litres of oil, which is believed to be one of the primary reasons for why the blaze burned for a number of hours. Staffordshire Fire and Rescue spokeswoman Michelle Hunt said: “The oil did catch fire. We don’t know where it was on the site but it was on Global Hygiene’s premise. On our log it said there was approximately 40,000 litres.” Whilst the oil was a primary concern for all involved, it is broadly believed that a gas main was involved in the fire which caused major problems for the emergency services. Although we do not currently know the cause of the fire, one thing we can take from this event is the importance of hazardous material storage. The storage of the oil at the Global Hygiene warehouse was of primary concern at the time of the blaze. Although Staffordshire fire and rescue were not aware of the exact location of the oil on site, it was vital that the oil didn’t catch fire immediately so that staff could be safely evacuated. Just one day prior to the fire at Global Hygiene, there was another blaze at an industrial yard in Enfield. It took over 70 firefighters to tackle the fire, which destroyed a warehouse after a huge stack of pallets caught fire. The cause of this fire is also unknown, but similarly highlights the importance of proper hazardous material storage. It is clear that there is a need for change in order to improve safety in the industry. In industrial sites, there should be an evaluation into hazardous materials handling, storage and transport. 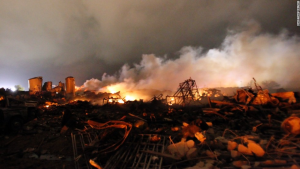 Industrial organisations must take a responsibility to work with the local fire department to provide key information, such as SDS sheets of the materials housed on site. In an ideal world every organisation should have a regimented emergency response plan in place to mitigate the risk to lives and the environment when disasters like this happen.